Full disclosure: This experience was sponsored in conjunction with the SPG Stars program I’m participating in, courtesy of the Starwood Preferred Guest® Credit Card from American Express. They gave me 70,000 Starpoints for this experience, which I redeemed for a stay at the St. Regis Mexico City. For the past several years I’ve been participating in the SPG Stars program, which has taken me to some pretty awesome places. I love the SPG Amex Credit Card, and it’s one of the cards I’ve had in my wallet for the longest amount of time. It was one of the very first cards I applied for when I was 18, and I’ve had it ever since. This year, in conjunction with my participation in the SPG Amex Holiday Challenge, I received 70,000 Starpoints to redeem for a winter getaway at a SPG hotel or resort in North America. Now, when most people think “winter getaway” they’re probably thinking about snow, but personally I’m more of a fan of warm weather. Over the years I’ve stayed at many of the best Starwood properties in North America using points, including the St. Regis Deer Valley, St. Regis Aspen, St. Regis New York, St. Regis Bal Harbour, and St. Regis San Francisco, just to name a few. My philosophy when it comes to points has long been to earn and burn. However, Starpoints are an exception, as it’s one of the points currencies I actively hoard. That’s because the points are so valuable and versatile, and I always try to redeem points that I think are ripe for devaluation first. At a minimum, Starpoints can be converted into airline miles at a 1:1 ratio, with a 5,000 point bonus for every 20,000 points transferred. I value my favorite mileage currencies at ~1.8 cents each, so factoring in the 25% transfer bonus I need to get at least ~2.3 cents per Starpoint to feel good about my hotel redemptions. Fortunately there are still lots of situations where redeeming points for hotel stays represents a great value. The St. Regis Mexico City is a Category 6 property, so a rewards night costs 20,000 Starpoints per night. Rates at this hotel vary wildly, though over our dates rates were over $500 per night including taxes and fees, so I consider that to be a good use of points. 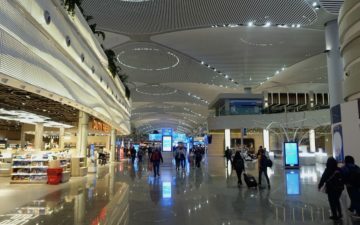 One of the best ways to maximize Starpoints is to redeem during peak travel periods, since typically the number of points required for a stay is fixed as long as a standard room is available, and doesn’t vary in the same way that room rates would. 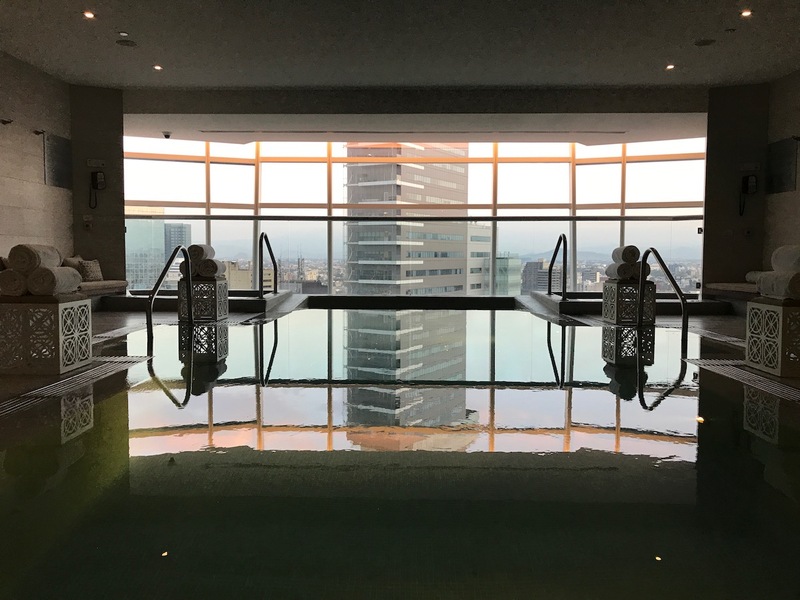 The St. Regis Mexico City is located in the ritzy Polanco area of Mexico City, which is beautiful, with all kinds of great restaurants and bars, modern high rises, and lots of culture. We arrived into Mexico City on a redeye and beat rush hour, so the drive to the hotel took only about 40 minutes (Mexico City traffic can be awful). Upon arrival we were greeted by the bellman and escorted to the lobby. The hotel has a first floor lower level lobby, though the main lobby is located on the third floor. The entire hotel was decked out with Christmas decorations. On the third floor is the hotel’s cozy lobby. As you exit the elevator the restaurant and bar are to the right, while reception and the (separate) guest room elevators are to the left. We were promptly helped at reception, where a friendly front desk agent had us checked in within a few minutes. As an SPG Platinum Elite member I was informed they were fully booked for the night so didn’t have any suite upgrades available, though we had been upgraded to a Grand Deluxe room. Furthermore, I selected breakfast as my Platinum amenity in lieu of 500 Starpoints. The cutest part of the lobby was that they had an area decorated for the holidays with all kinds of candy and nutcrackers, and they had stairs leading up to it, so that kids could easily reach it. Adorable! The elevators to the guest rooms were just around the corner. This hotel has the types of elevators where you type in your floor number and scan your card, and then it tells you which elevator to use. Our room was located on the ninth floor, #920. As you can see based on the floorplan, the hotel is in a circular shape. The room featured a long entryway with the bathroom to the left. That led into the rest of the room, which was a very good size. I appreciate that. St. Regis properties pretty consistently have large rooms, and once you get into the Grand Deluxe category (which is a pretty common upgrade), the rooms almost feel like junior suites, given that they have a seating area. The room featured a comfortable king size bed. I love the quality of the St. Regis mattress and bedding. Next to the bed was a chair with a side table, which had a plate of fruit as a welcome amenity. Then across from that was a comfortable “L” shaped couch, where I spent quite a bit of time working. My awesome Starwood Ambassador left me a welcome amenity of water (still and sparkling) as well as nuts and snack mix. Next to the couch was the desk immediately below the wall-mounted TV. This is also where the minibar and Nespresso machine were located. The room had great views beyond Paseo de la Reforma, and I imagine the views get even better on higher floors. The bathroom was back near the entrance, and featured double sinks (which is always an unexpected treat in a non-suite), a partitioned off toilet, and a separate area with the shower and bathtub. The shower had both a rainforest showerhead and a handheld one. Meanwhile I found the bathtub to be quite claustrophobic, as it was surrounded by walls on all sides in the area where you’d sit down. The room featured Remede toiletries, which can be found at many St. Regis properties, and which I’m a big fan of. Overall I thought the room was nice and spacious. I’ve seen St. Regis properties with more over the top decor and I imagine at some point this hotel will be refreshed. For the most part everything in the room was in working order, though I was a bit surprised that the curtains and weren’t automated, and that there wasn’t a high-tech bedside control for many of the room’s functions. This is of course a total first world problem, but just about every St. Regis property I’ve stayed at has automated blinds, etc., while this one doesn’t. Furthermore, the blinds were broken and dangling from the ceilings on both sides, so that the room didn’t get fully dark. To the hotel’s credit, when we were brought to our room upon check-in the butler noticed this right away and asked if it was okay if they sent someone to fix it. We were tired and just wanted to sleep and said it was alright, though you’d think that’s something housekeeping would have picked up on. The wifi in the room was fast, and is free for all SPG members. Starwood Preferred Guest elite members as well as those with the SPG Amex Credit Card receive complimentary premium intrnet access. In terms of the hotel’s other features, the King Cole Bar had complimentary coffee & pastries every morning. I always appreciate when a hotel offers complimentary coffee in the morning, as I like to have a cup of coffee while waking up and working, before actually going to breakfast. 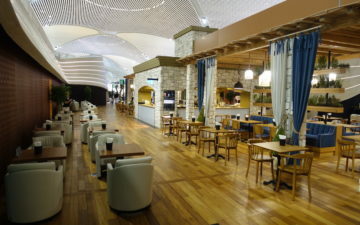 Then breakfast was served in Diana Restaurant from 6:30AM until 11AM. 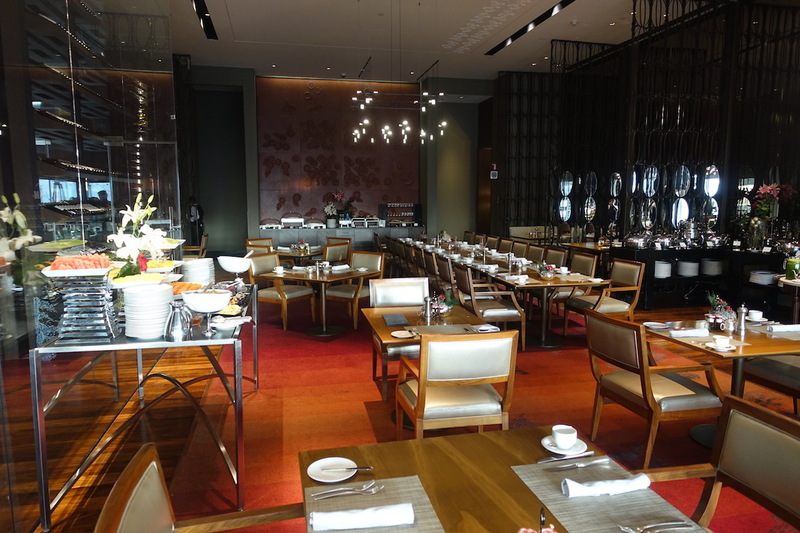 The restaurant feels grand and typical of St. Regis, and the service was excellent. 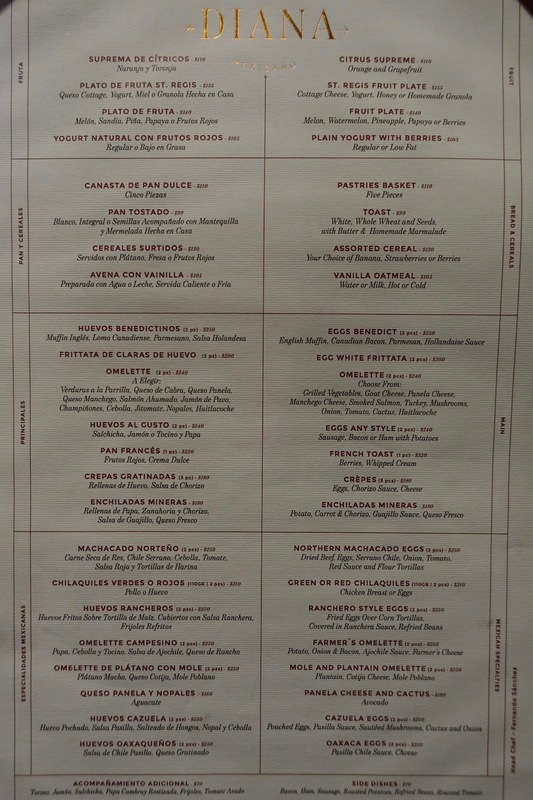 In addition to a large buffet, there was also an a la carte menu. Thanks to my SPG Platinum Elite status we had access to the buffet, and could also each order one thing off the menu. The buffet itself was more than sufficient, with freshly squeezed juice, all kinds of bread, pastries, cold cuts, cheese, fresh fruit, cereal, and several hot options as well, including waffles, scrambled eggs, quiche, sausage, etc. The highlight, however, were the Mexican specialties on the menu. I had the mole and plantain omelet both mornings, which was the best omelet I’ve ever had. Ford enjoyed the cazuela eggs the first morning, and had the mole and plantail omelet the second morning, per my recommendation. In terms of the hotel’s other features, the gym, pool, and spa were all located on the 15th floor. The pool was on the small side, though beautiful, with great views over the city. There were also a couple of hot tubs. The gym was right next to the pool, and consisted of two different areas — to the left was the cardio area , and to the right was the weights area. Mexico City has incredible restaurants, so we spent most of our two days outside of the hotel, exploring and eating. The only other thing we did in the hotel was visit the King Cole Bar one night. Almost all St. Regis properties have King Cole bars. It’s an iconic bar, and the bloody mary was supposedly even invented at the King Cole Bar at the St. Regis New York. While the inside of the bar had the typical classic King Cole Bar decor, the bar also had a beautiful patio outside which felt untraditional for St. Regis, but which I loved. It had a live DJ and the first night we couldn’t even get a table there, that’s how busy it was. The St. Regis Mexico City was a great base from which to explore Mexico City. The hotel has a great location, is nicely designed, has large guest rooms, and has an excellent breakfast and public facilities. Furthermore, over our dates it was a great use of Starpoints, given how expensive the rates were. I’d definitely recommend this hotel, though I’d note that there are also several other great Starwood hotels in Mexico City. For example, earlier this year Tiffany reviewed Las Alcobas, which is in a similar area, and is a Category 6 property. It’s has just a couple of dozen rooms and a cool design, so it’s a great alternative for someone looking for a more intimate experience. What Benefits Do Chase Sapphire Reserve Authorized Users Receive? Are you still in Mexico City? Would love to grab a quick selfie! Great review, Ben! One thing to note is that the St. Regis is actually not in Polanco, but in Reforma. I stayed at the Four Seasons in November, which is across the street and down a couple of blocks toward the park from the St. Regis. As a counterpoint, it’s a more low-rise hotel designed like a hacienda around an enormous, gracious courtyard. The service and food was phenomenal. The rooms have been recently refreshed, and the decor is generally tasteful and luxurious, although the wall to wall carpets — sort of a cream and red Jackson Pollock random splattering — are distinctive enough to not necessarily be soothing. The room refresh, however, seemed to leave the marble bathrooms alone, and the bathrooms are spacious and nice enough but absolutely feel dated. I would note one other drawback of it being an older property than the St. Regis — as well as a more spread-out, low-rise one — is that it can be a very long, circuitous walk to your room from the elevator. Otherwise, it’s another excellent hotel worth pointing out, one that generally has rates available for under $300 USD per night through American Express Fine Hotels & Resorts. The location is closer to Chapultepec Park and on the “right” side of the Paseo de la Reforma making it slightly closer to Roma and Condesa, but by and large the locations of both are excellent. 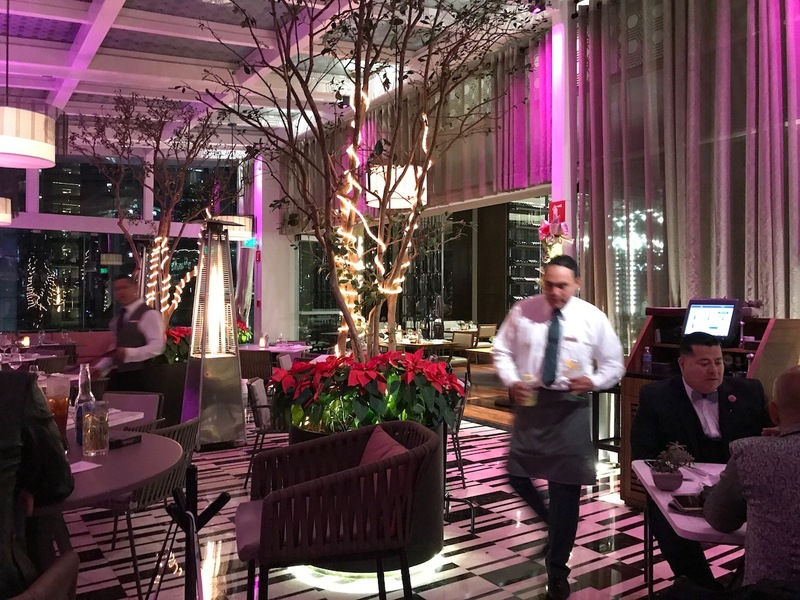 The St. Regis seems absolutely sleeker, but there is no question that the Four Seasons feels more luxuriously Mexican, in that it is designed around a fabulous courtyard with plenty of communal areas (and an excellent, and very Instagrammable, patio bar). Did you try the signature Bloody Mary? Since you mentioned the possibility of a better view from a higher floor I wanted to point out at this property only the first 14 floors (I think that’s the number) are hotel rooms and the rest of the floors above are all condominium residences. Were there any illegal Americans running around working in the hotel? Hi lucky, greetings from the st regis bali! seconding micheals comment on stars program! Am an SPG ambassador (love Mike D!) with over 200 nights lst year and over $1MM a year in Amex Spend. Is that something i could try to qualify for? Cheers! lucky- we’re going to Mexico shortly and staying at the JW Marriott (very close to the St Regis, and considerably cheaper at the time we were going). Any thoughts on that hotel? Also, any restaurants or specific things to do you recommend would be great. 1. This isn’t a review. It’s sponsored content. On Instagram, you labeled it an advertisement. An italic disclosure isn’t enough. This is sponsored content and it should say so in the title. 2. I’m surprised at how un-luxurious this hotel is. 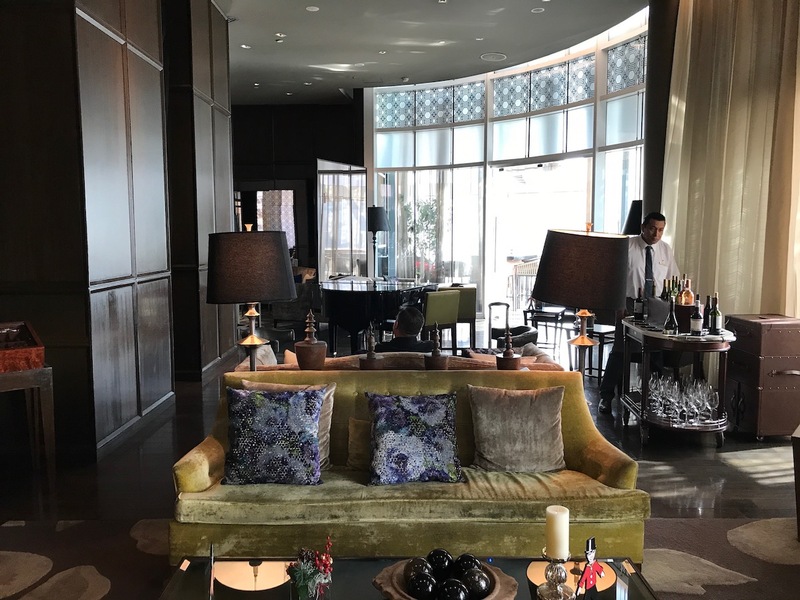 It looked perfectly fine for a JW Marriott, Westin, Renaissance or Marriott, but for St. Regis it looks a little too bland and a little too generic. I’m also surprised there is a Nespresso coffeemaker in the room as I thought one of the hallmark St. Regis services was butler-delivered coffee. Does this property offer unpacking and repacking services? 3. I can’t believe the hotel gives free coffee and pastries out at the bar. I say can’t believe because that’s what some hotels, including Hilton’s Waldorf-Astoria, call a “continental breakfast” and provide their top-level elites in lieu of a proper breakfast. There are New York hotels that would charge $30 for that coffee and pastry. The St. Regis is definitely not in Polanco. It’s about a 30 minute walk to heart of the Polanco neighborhood. Lots of celebrities stay here as well as the Ritz. Whenever there is a big concert in Mexico City, you can count on a crowd of people outside the entrance. I’ve only stayed at one st regis (mauritius) but I can confirm there was a Nespresso machine in my suite in that hotel. Lucky’s airline reviews are the best in the industry. Hotel reviews (particularly luxury hotels) still need more work. Look at Gallivanter’s Guide as inspiration. Still much prefer to read posts by Lucky than other bloggers who write on OMAAT. I recall a review by someone at a hotel in Maui who didn’t even have elite status. HA! Nice hotel, yes, but no, it is not in Polanco. The hotel is in Paseo de la Reforma at Colonia Cuauhtémoc, a different part of Mexico City. Close to Polanco, but no, it is not in Polanco. This hotel is in quite a bland part of the city, not sure why you said its a good location at all. The hampton inn centro historico is actually better situated right near Zocalo Centro in all the action, and obviously much better priced and basically the same in terms of comfort and amenities. @Ben Holz: He doesn’t mention it because he was paid to write this and post Instagram pictures. The St Regis is not in Polanco. It is in La Reforma. We stayed at the W prior to St Regis and it is in Polanco as is the JW Marriott. The W has its problems, not managed well, but the reason we moved is because people (guests) were getting robbed outside, at gunpoint. Although Polanco is supposed to be a Glitzy area for shopping it is not totally safe. And of course the St Regis is a much better property and well run organisation. The city closes off traffic on Sundays and holidays, which made the large avenue really nice. We were there a number of days and experienced some staff problems, and to their credit the top management made it right to us and dealt with the staff. We commended them because they took it seriously and handled it most professionally. @ Lucky – Since you came in off the Redeye, did you pay for the night prior or did they have a room ready that early? They were obviously ready for you since the amenity was in the room but interested to know. Ben, also curious what their signature Bloody Mary was since you usually try them. I agree, with previous notes, The Four Seasons is more Mexican Luxury…. Why would you go to Mexico City, one of the greatest (if not the single greatest) food cities in the world, and eat breakfast in your hotel? Are you going to publish a review about Mexico City? I agree that it would be insanely silly to have a hotel breakfast in Mexico City (personally I hardly ever have those when i travel) but part of being a hotel reviewer is reviewing the hotel. Sad. I know.